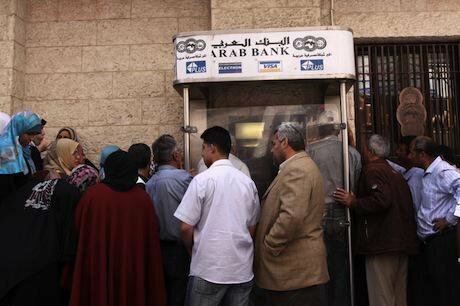 A branch of Arab Bank, Gaza, 2010. Demotix/Horseman Rapid. All rights reserved.Just before Christmas we wrote an article for openDemocracy about the sudden and inexplicable decision by the international bank HSBC to close down a number of Muslim bank accounts. We interviewed four of the victims and reported their speculative claims that pressure from the United Arab Emirates was behind the decision. We also reported that there was persuasive evidence that some of the pressure was coming from the United States. It is now possible to give a much more accurate account of events. This follows the publication of a brilliant and comprehensive paper by a former banker called Tom Keatinge. Keatinge brings almost unlimited expertise to his task. In his report Uncharitable Behaviour, he argues that ever-stringent counter-terrorism regulation is hampering charity banking worldwide. While much of the blame can be attributed to the UK government which has failed to help charities in trouble, a great deal of the pressure is coming from the United States, in particular the US treasury and through the US courts. He demonstrates that the United States is now using the Office of Foreign Assets Control, which administers and enforces economic and trade sanctions based on US foreign policy, to wage its so-called war on terror. He highlights the case of the Jordanian Arab Bank, which was found guilty by a US jury last year of giving financial assistance that helped Hamas militants carry out attacks that killed or wounded American citizens in and around Israel. The plaintiffs – nearly 300 victims of terror attacks in Israel, Gaza and the West Bank from 2001 to 2004 during the Palestinian uprising known as the Second Intifada – alleged that Arab Bank held accounts for Hamas members and transferred funds to Hamas organisations. They brought the case even though this activity was legal in Jordan, the country where the bank was operating and is headquartered. Arab Bank said it planned to appeal. Another trial expected in May this year will determine the damages owed to the plaintiffs. Specifically, Arab Bank was accused of facilitating transactions to known terrorists and a charity called the Saudi Committee, which it was alleged, sent money to the families of Hamas suicide bombers. The Saudi Committee was not on a US terrorist list, or proscribed as a banned group by any government during the years relevant to the case, the bank said. It argued it rigorously checked terrorist blacklists when transferring money to accounts. But this wasn’t enough. The claimants said that the bank should have conducted its own research and established whether these individuals were terrorists, even though they did not appear on blacklists. The defence said the idea that banks and private sector should have to draw up lists of terrorists was a nonsense and that this was the government’s responsibility. As the first-ever terrorism financing civil case in the US, it is hard to underestimate its significance. It paves the way for more litigation against banks under punitive US anti-terrorism laws. Hamas was a designated terrorist organisation in the US at the time of these transactions but, crucially, not in Jordan. In other words, is it fair that a bank can fall foul of the law in a foreign country even though it is operating legally in its own? But there is a wider point here. In post 9/11 America, there are questions over whether Muslims, individuals or organisations, get a fair trial. Arab Bank is a case in point. For its part, Arab Bank maintains that it rigorously followed its compliance procedures. After the trial it said the decision “exposes the banking industry to enormous liability for nothing other than the processing of routine transactions…even if all governmental requirements are followed and the parties receiving services were in good standing with these governments”. The case of Interpal, a British charity which gives aid to Palestinians, is equally significant. Interpal has been designated a terrorist organisation by the United States since 2003, but has repeatedly been cleared by the British Charity Commission of any involvement in terrorism. In 2006, 15 families of the victims of suicide bombs filed claims in the US against NatWest, alleging that they knowingly allowed customers to move funds via Interpal to Hamas. They claimed that this in turn meant that the bank bears some responsibility for various terrorist attacks on Israel, including a suicide bombing in Jerusalem in 2003 that killed 20 people and injured more than 130 (though reports of casualties vary). Although the lawsuits were dismissed by a US district judge in 2013 they were revived on appeal in September in light of the Arab Bank case. NatWest (part of the Royal Bank of Scotland group which is majority owned by the British government) now faces the strong possibility of paying out on massive claims subject to the decision made by a New York jury. Never mind the fact that the UK Charity Commission, the Bank of England and the Metropolitan Police’s Special Branch have all cleared Interpal of being involved in terrorism. NatWest could now be forced to pay huge sums at the whim of a group of 12 New York jurors. Were it to refuse to do so, it would be banned from doing business in the United States. No wonder then that HSBC and other international banks are terrified of doing business with Muslims. George Osborne, chancellor of the exchequer, likes to bang on about British sovereignty when it comes to Europe. However he has not lifted a finger to stand up for British banks when it comes to dealing with what amounts to bullying from the United States. Ed Balls, the shadow chancellor, has been equally silent. Both the Conservative and Labour parties need to ask themselves where their loyalty lies. Is it to British banks and British citizens? Or is it to the United States of America?